Improving your traction whilst driving on snow or ice requires a set of winter tires and tire chains (often referred to as snow chains). You can attach the chains to either the all the wheels or just the ones that apply the power (front or rear wheel drive). The best tire chains are the Security Chain Company SZ143 Super Z6 Set, which fit the majority of passenger vehicles and can be used within limited clearance setups. 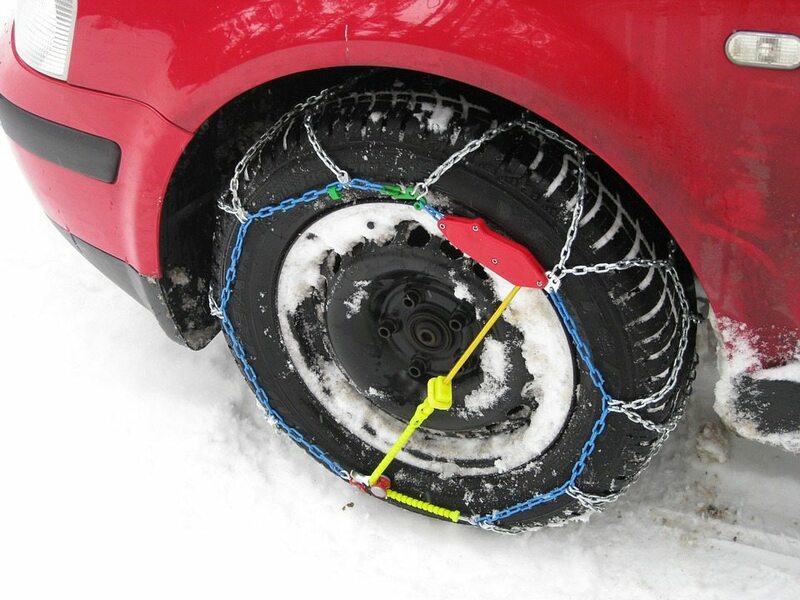 Tire chains for snow and ice is something that can be stored easily in the car for when traction is a real issue. They are various designs that suit all vehicles from trucks to cars and selecting the correct type will improve your grip on any driving surface. Tire chains are not an essential piece of equipment for all drivers as some areas will snow more often but considering the low cost of them, they are definitely a worthwhile investment. Until you have been stuck with limited traction, you will not be able to understand the effectiveness of tire chains. One of the main factors to consider is how much clearance there is because if the tire chains collide with your wheel arch, a costly repair bill heading your way. Over the past years, tire chains have improved with higher speed ratings, durability, ease of installation and much more. Below is a list of the best tire chains that will provide maximum traction in snow and ice. 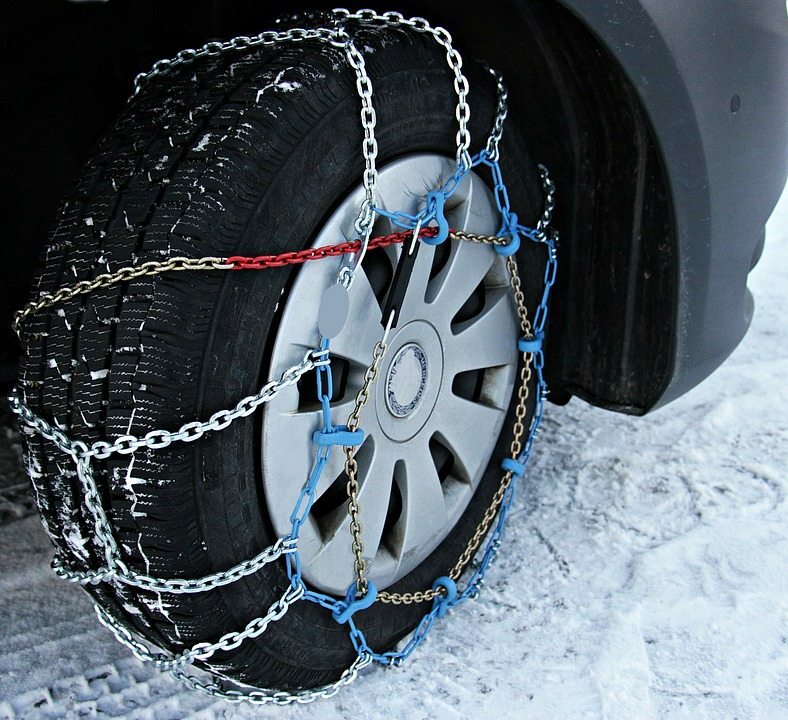 Security Chain is the most popular brand in the snow chains industry and for good reason too. They produce a wide variety of chains to suit all passenger vehicles from cars, pickups, SUV’s and much more. They are even compatible with cars with limited wheel clearance, which is a huge benefit of sporty vehicles. Unlike many of the cheaper alternatives, these are designed are a rubber cable construction that sit tighter and need no tightening once installed. Overall, they are the best tire chains for cars that are versatile and designed to be high performing (rated class “S”) when used with anti-lock brakes, traction control and more. You can use these tire chains on tires that range from 215 to 285 millimeters wide and they only need 6.33 millimeters of sidewall clearance. 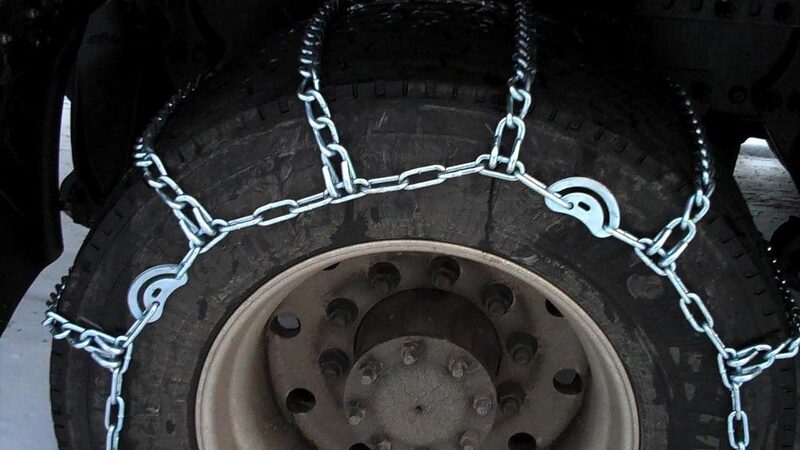 Tire chains for trucks can be difficult to find but the Security Chain Company provide a solution for this. The ZT728 Super Z LT are designed for light trucks and SUV’s and meet S.A.E class for clearance requirements. These truck tire chains use a rubber cable construction that are more durable than the conventional chains or cables and will work with all electronically monitored control systems. The design on Super Z LT is similar to the one above but more heavy duty and suited for trucks and SUV’s. It also has the addition of a rubber tensioner that is built-in for easy re-tightening of the chains. Overall, the ZT728 Super Z LT by the Security Chain Company are the best tire chains for trucks with a more rugged design compared with the car alternatives above. If you are willing to spend the extra on the ultimate set of tire chains for snow and ice, then the Konig K-SUMMIT K23 are a set you should consider. They work using a ratcheting system that automatically self adjust and tighten as you drive with an advanced geometric design and self-tension system. Konig were bought out by Thule in 2004 who produce a wide variety of premium roof cargo boxes and more. This instantly boosts these tire chains credibility as they come with the reputable 5 year warranty, which is trade mark of all Thule products. One of the standout features of these tire chains is the fact that their is no clearance behind the wheel and it does not touch the alloy wheel whatsoever. Overall, they are the ultimate tire chains but the high price tag will put off the majority of drivers. However, if you drive on snow and ice frequently, these are a worthwhile investment that can be used on the majority of vehicles. Another set of tire chains by Security Chain are the Peerless Auto-Trac that meet the class “S” clearance requirements. They use a self tightening ratcheting system and are easy to install and will remove completely in minutes. Unlike many of the alternatives, the Auto-Trac uses a diamond pattern, which are known to grip better in the snow. However, the downfall is that you are limited to just 30 MPH using these snow chains but if the snow is that heavy, you wouldn’t want to exceed that speed anyway. Overall, they are the best snow chains for heavy snow with a range of different sizes to choose from. However, if you are planning on driving on icy or muddy surfaces, the above example will be the better buy. If you are on a budget and only want a set of tire chains for emergencies, then the Sanku set may be exactly what you need. They are universal and fit tire widths from 165mm to 265mm for all cars, trucks and SUV’s. They are only rated to 25 MPH but this may be all that is required to gain traction whilst travelling small distances. If you are travelling frequently on snow and ice, we highly recommend choosing a higher quality set of snow chains as shown above. Overall, if you are looking for a set of cheap tire chains, these are ideal and can be easily stored inside your trunk. Of course, as they are so cheap, you can’t expect them to perform as well as the others with regards to traction, durability and installation. On a majority of Alpine roads, the use of snow chains is mandatory since they help increase your vehicle’s grip on a road covered with ice and snow. In the UK, this trend is slowly gaining momentum both during summer when passing over grass and winter when passing on roads covered with snow. The US however is where the use of tire chains is highly popular. Before purchasing snow chains, you must first read your vehicle’s instruction manual and find out whether or not it is compatible with fitting snow chains around its tires. Therefore, before putting on the chains, go through the snow chain database and choose the model of your car, your vehicle’s engine size and the car’s tire size. The reason behind this is some car models do not allow fitting of snow chains since they may be too close to brake pipes and also electronic detecting equipment which cannot handle metal in areas where there’s only rubber. Thus, if your vehicle’s handbook states the against the installation of traditional snow chains, you should opt for the “ladder track” chains which fit in all cars it is just a matter of finding the right size for your vehicle.Snow chains usually come in pairs and are installed in the driving wheels, with some people preferring to fit them also on non-driving wheels which is okay because it improves the vehicle’s stability. Systems like traction control and anti-skid should always be turned off once you’ve fitted snow chains, with your car handbook guiding you on how to turn this system off. Despite most cars being compatible with the installation of snow chains, the distance between tires and some of the internal parts varies from one car to another. Therefore, before installing the snow chains, use your vehicle’s owner’s manual to see if they can be fitted, and if so the measurements of the three sides your car’s tires. These measurements include the wheel height ratio, the tire’s width and finally the diameter of the tires usually expressed in inches. This snow chains in comparison with other traction devices offer an improved braking performance and better grip, both on snow and ice. The components used in making this snow chains are of high quality thus even with daily use, they can last effectively for a couple of seasons. Additionally, the installation of premium chains is far much simple in comparison to other chains thus the amount of time you spend exposed to the harsh elements is substantially minimised. Despite being the most expensive of all other chains, for those drivers who value quality, these chains are the best as they provide an ultra-dependable traction control during winter. This snow chains fall right in the middle regarding durability, performance and price, making them an excellent choice for drivers who experience regular snowfall. Furthermore, they do provide an excellent traction control, plus being able to withstand frequent use all season long. In comparison to entry-level chains, these chains are much easier to install and come with installation accessories. Regions that experience infrequent snowing, entry-level snow chains are the best option to choose. These chains improve the vehicle’s traction control on both ice and snow, nevertheless, these chains are only ideal for use periodically and in cases of emergencies. Finally, if you live in an area where encountering icy or snowy road is an often occurrence, premium or standard snow chains are a better choice, unlike entry-level snow chains. Lastly, after deciding on the snow chain model and the size of your car’s tire, choosing the size of a snow chain is the next step. There are numerous fitment guides that you can use to decide on snow chain size that best fits your needs. Once you determine on the snow chains you need, cross-reference it to the tire size you want, and after purchasing it, test fit to ensure it they fit perfectly. Moreover, this makes you get used to the installation and removal of the snow chains while in a safe environment. Whenever there is too much snow or ice on the road, the use of snow chains becomes necessary to avoid the car skidding due to reduced traction control by the car’s wheels. Whereas main roads are cleared of the snow, using them is not ideal, but upon reaching roads not cleared of snow, you will have to stop and put them on your wheels. While installing the chains on the wheels, putting on a reflective jacket is crucial even after choosing a safe place to mount the snow wheel chains.Nonetheless, to be able to fit this chains, one requires to have practised in a safe and dry place, ideally at home, so as not to panic while putting on the chains in the cold, harsh weather.Finally, having two pairs of snow wheel chains is better than one pair of snow wheel chains. However, four-wheel drive vehicles need the chains on all its wheels. Always have the anti-skid or traction control turned off. You should continuously drive at speeds of less than 30mph. Furthermore, slowing down around bends is critical, and also fast acceleration and braking are highly discouraged. Drive slowly since spinning the wheels could lead to damage to the vehicle’s suspension or steering when it comes into contact with a tree stump or rock. If the chain is broken or dented, immediately stop and take them off. Always check for worn out connectors when removing the chains from the car’s wheels. Before storing the chains, always clean and dry them since this will increase the snow chain’s lifespan. Traction is a really issue when travelling on snow or ice but introducing tire chains can solve all your issues. Simply storing them in the trunk will ensure you are equipped for all driving conditions. Even when using the winter tires, you can still find yourself caught out by large amounts of snow or ice. Installing tire chains can make the difference of being stranded or driving wherever you want. There are many different types of tire chains but not everyone will need to spend large amounts on the best tire chains. However, if you are travelling in bad conditions on a regular basis or planning on going to a snow or ice location, we highly recommend the premium examples.